I wasn’t sure what to name these cookies. They are loosely based on a recipe for “I want to marry you cookies” but are missing the white chocolate chips and some of the brown sugar. I also added toasted pecans, browned the butter and substituted quick oats in place of the rolled oats. What really intrigued me about this recipe was the method. My husband asked me if I would bake some cookies for his office planning meeting. I’m always thrilled to send goodies to his co-workers because they gush over the treats and make me feel good. I am very jealous of their organization, commitment, professionalism and team spirit. Being one of their favorite bakers makes me feel like I’m part of the team or something. It’s a small part I know, but no less important! There are several things that make this recipe less than traditional. One – you don’t need a mixer, and two – you can make the dough in a large saucepan. The end result? A totally satisfying and really good chocolate chip cookie with toffee overtones. 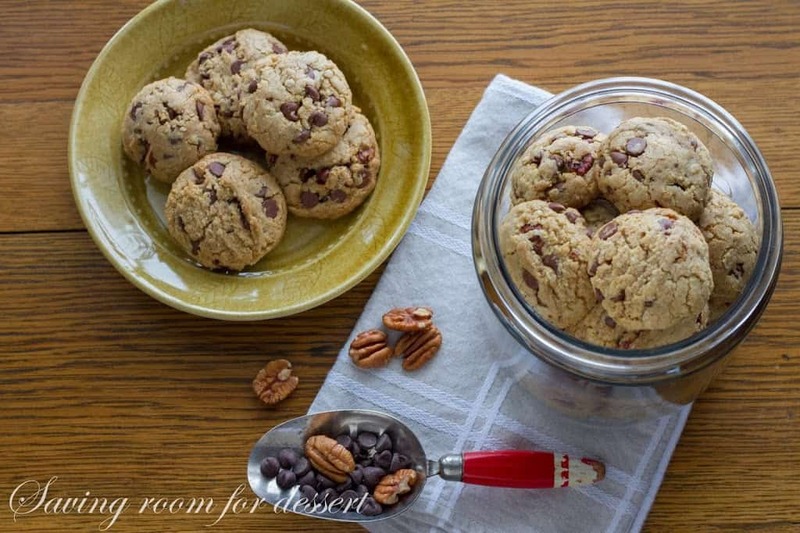 They have a great texture with a light oat flavor, a touch of cinnamon, and a nutty flavor from the browned butter and toasted pecans. I also love that they don’t spread all over the pan and kept a thicker profile. 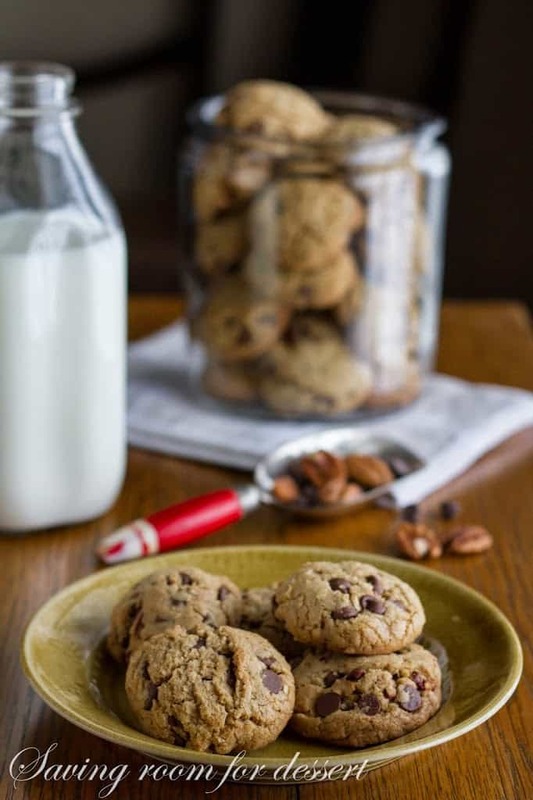 The added oats gives these cookies a wonderful texture! In a large saucepan melt the butter over medium heat. Continue to cook the butter until the solids separate and lay on the bottom. Watch the butter closely and occasionally swirl the pan as the solids brown and the butter begins to have a slightly nutty aroma. Remove the pan from the heat and immediately add the dark brown and granulated sugars. Stir until the sugars are incorporated and smooth. Chill the mixture for 10 minutes. This butter-sugar mixture creates the toffee flavor that is so unusual in this cookie. Remove the sugar-butter mixture from the refrigerator and add the whole egg, egg yolk, and vanilla. Stir with a wooden spoon or spatula until blended. Add the flour, oats, baking soda, salt and cinnamon. Fold together until blended and then add the pecans and chocolate chips. Using a 2-tablespoon scoop, form the dough into balls and place on a parchment lined baking sheet. Chill the dough balls for 30 minutes. Preheat the oven to 325 degrees. Bake the cookies on a light colored parchment lined baking sheet spaced 2 inches apart for 14-16 minutes or until lightly browned. Cool completely on a wire rack and store in an airtight container. There you have it – the perfect cookie for any occasion! I have so many recipes I want to try this weekend. What do you have planned? Reading a good book? Going to see a movie? Maybe just doing laundry? Whatever you do I hope you have a great time. Thanks so much for stopping by! Hello, Cookie! These look so good I can't wait to try making some. It's hard to improve on a chocolate chip cookie but love the oats in these. 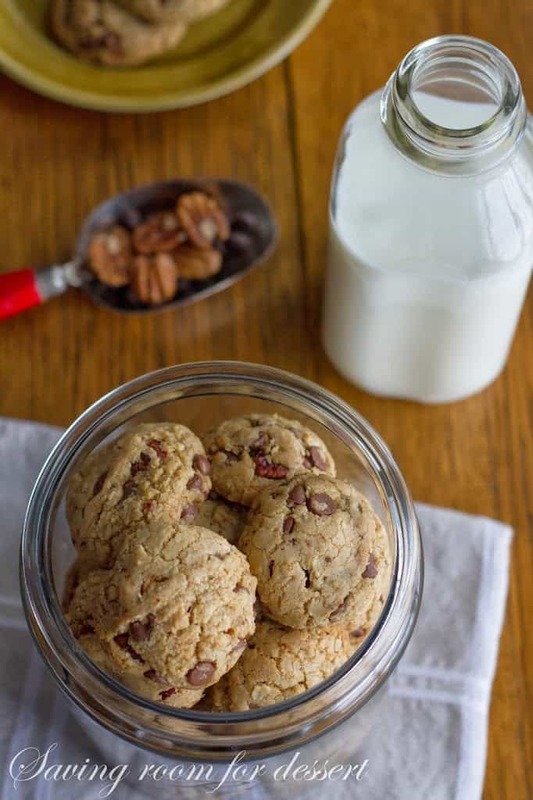 These cookies look and sound fantastic!<br />Love the pics with the milk bottle and the nuts – so beautiful. I am with Chris's suggestion of calling these "I Want to be Your Best Friend Cookies". They look fanfreakingtastic, Tricia. What a lovely cookie recipe – I need to find a reason to make them soon. 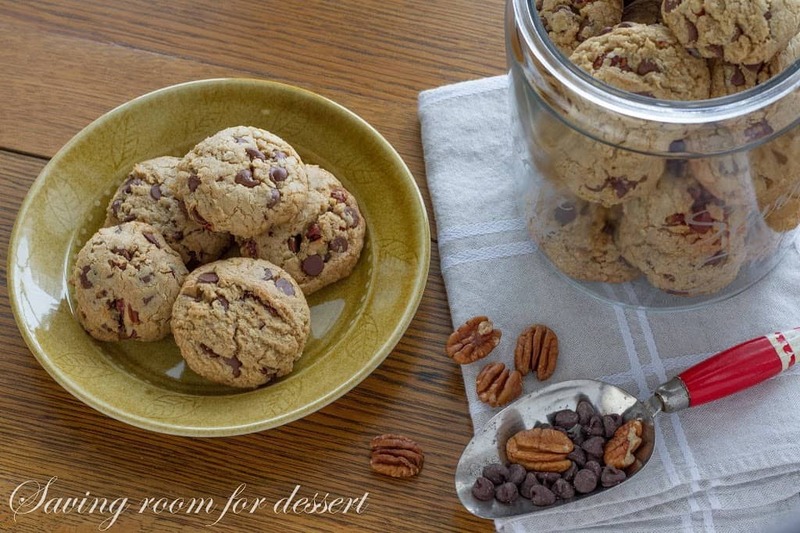 Love Chirs' comment above, "I want to be your best friend cookies" – Ha! I know you are one of my favorite bakers Tricia so I'm sure if you get to sample the real thing, not just look at pictures, there would be no question. I think since you altered the "I Want to Marry You Cookies" recipe, maybe we should call them "I Want to be Your Best Friend Cookies". What do you think? 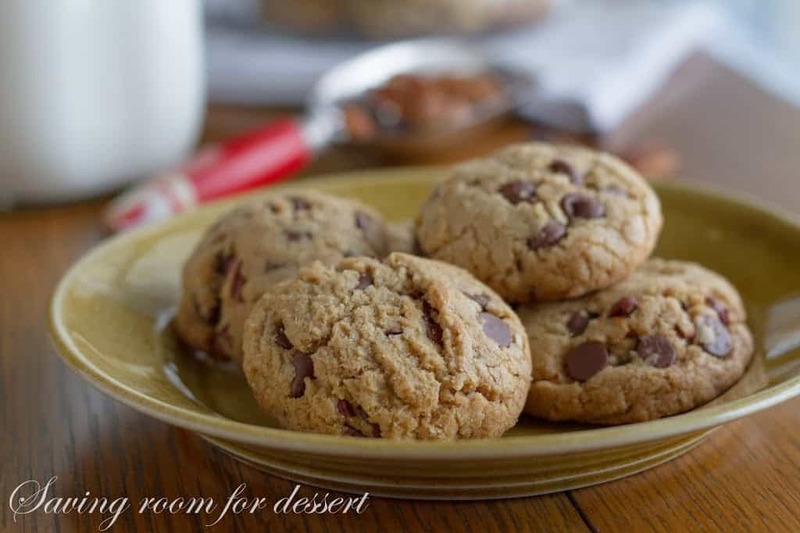 These cookies look amazing, always on the lookout for a great chocolate chip cookie recipe. Beautiful photos!! the cookies sound amazing! These would be dangerous in our home, we have to many cookie monsters living here and believe me- they would not last an hour. LOVE your recipe anyway! Marry Me cookies are my all time favorite chocolate chip cookie and your version sounds fantastic! I haven't made a classic chocolate chip in a few years. Melted butter trumped everything else! I wish I was at your husband's office today! These look great, Tricia!